These are primarily adult titles, but there is the occasional YA title. Good for your personal reading lists! 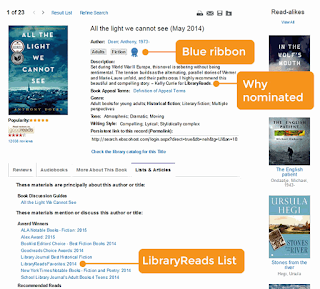 "[...] LibraryReads is a feature that highlights the "top ten books published this month that librarians across the country love". Back when LibraryReads first started, the NoveList team decided to make these monthly lists a priority, and provide read-alikes for every LibraryReads book suggested. [....] It is now easier to find LibraryReads books in NoveList. Each book (going back to the first one in 2013) has been tagged as a "LibraryReads Favorite." You'll find NoveList under the Visual Tab in your Destiny catalog.